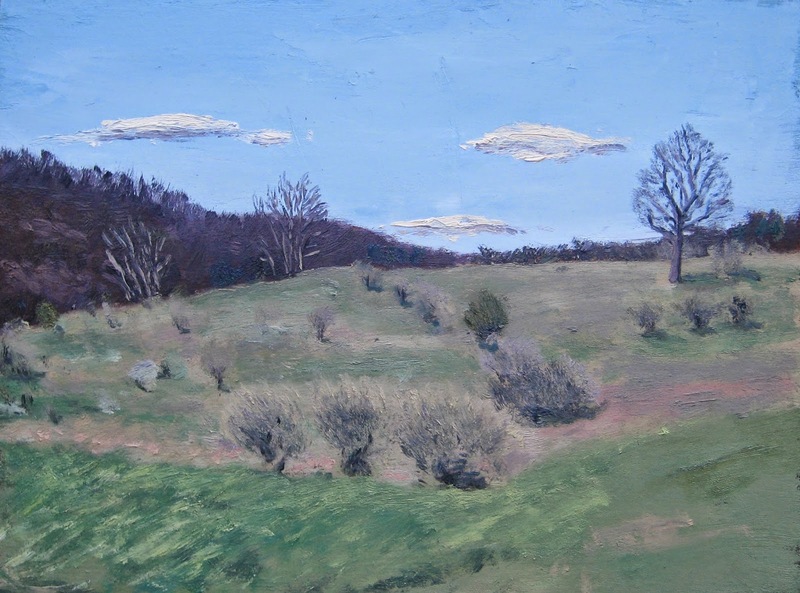 Matt Chinian Painting Blog: A sketch and a revisit some sun and some rain. 64 K some sun, lots of clouds and a bit of rain & wind! This is where I ended up today after working on this and a small sketch. I'm liking these paper sketches. The blue tape will come off after a day or so and leave a clean rectangle. The session started in sun, and got cloudy soon after I started. it looked much better in sun. The only down side is that the edge gets obliterated while painting, and that it's in the middle of the board and not right on the side. Here is the scene with a bit of light! I'll take the tape off and take another photo of it. There is something about this scene, and with this light, I knew it would be a dramatic effect. The first 1/2 of the session went by without a photo, then it rained, with gusty winds. I packed it in. 1/2 hour later the rain stopped, the sun came out again so I went back. The scene had changed, but not by much, by now it's after 7:00 and I still have light! Last years painting from the same spot. The sky changed dramatically while I painted, and I wasn't as happy with them as with the rest of the painting.